Trying to educate myself on something that interests me being high performance high availability servers / infrastructure. Unfortunately everything I seem to read is product specific and doesnt really help me with what I'm trying to achieve. I am looking at redoing our internal infrasture in a non-production environment so as to learn some new things. What I want to build is layed out below on the attached diagram. Two internet connections connected via ethernet to WAN failover router. 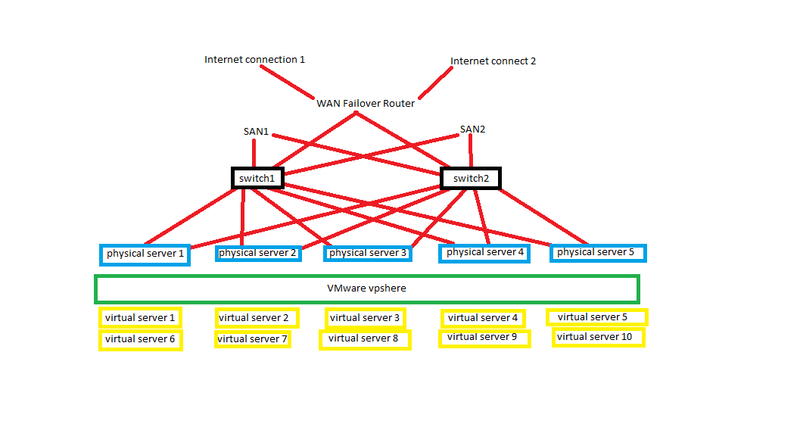 Two ethernet connections from WAN failover router to two switches. Two SAN devices connected via ethernet to two switches. Two ethernet connections from server to switches. Each server has two NICs, one connected to each switch. VMware vpshere running on all physical servers to pool and manage resources better. For example: my current DHCP server is Server 2008 Std 64bit on a 3.33ghz quadcore Xeon with 8gb RAM. Massive overkill. 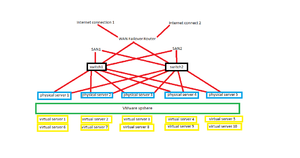 Virtual servers for each of the functions I need that I can deploy new ones without any additional infrastructure purchases. I want to build this to last 5 years at current growth rates. Can anyone point me in the direction of educational material that is _NOT_ product biased. I am not too worried whether solution is off the shelf, open sources or a mixture. I just want something that will work.